We love this how-to because it’s an Easter craft for anyone and everyone. All you need are a few craft supplies and these bags are ready to be filled with Easter treats! Learn how to make these Easter bunny gift bags here. For personalized bunny embellishments, don’t hesitate to mix and match colorful paper bags and crepe paper ears. In our example, we’re going with a classic white with pink-ears look and pairing it with colorful crinkle cut paper for a little fluff. First, using your marker and your white handled bag, draw your happy bunny face onto the surface of your bag. Next, create your ears. Starting with the outer ear, take a sheet of white crepe paper and cut out a bunny ear shape. Finish up your ears using your pink crepe paper and cutting a slightly smaller bunny ear shape. Glue this pink piece onto your white bunny outer ear. After each ear has been assembled, Use your glue to attach each ear to the inside of the bag. Finally, don’t forget the tail! Give your treat bag a finishing, fluffy touch with a little bunny tail. 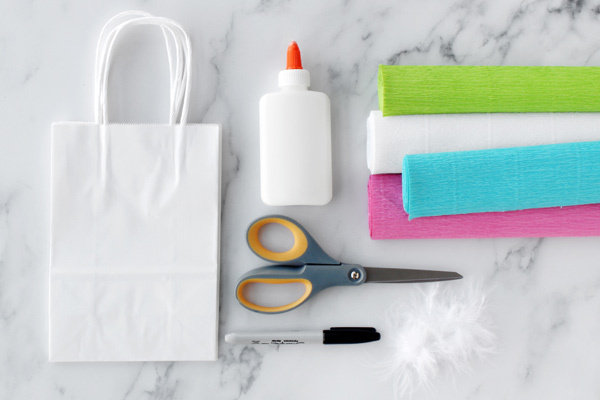 Take your feather puff and remove the paper backing and attach it to the back of your bag. FYI: These adorable treat bags are great for holding sweet treats wrapped up in adorable easter packaging! Wrap your cookies, homemade candies, and baked goods with food-safe cello bags. 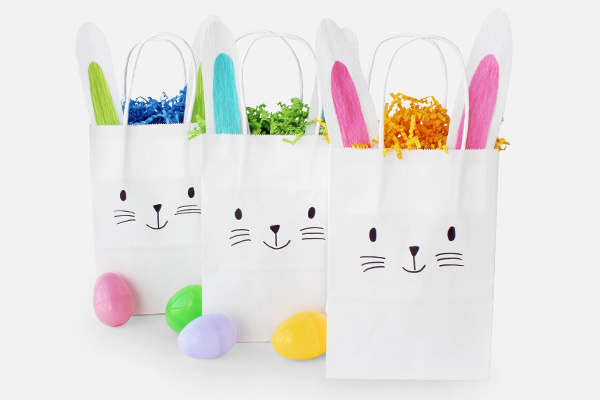 Check out our adorable Easter bunny cello bags here! Springtime is the perfect season to get creative. With some crepe paper and a little creativity, your Easter celebrations can be easily embellished. Loved this DIY? Us too! We’ll be making more all year long, so stay tuned for more DIY craft videos, tips for small businesses, and product features! I wish I still had a preschool; these would have been so much fun.